Sofosbuvir/Velpatasvir (Epclusa) for Hepatitis C | The Medical Letter, Inc.
CLINICAL STUDIES — Approval of sofosbuvir/velpatasvir was based on the results of four randomized trials in treatment-naive and -experienced patients with HCV infection. ASTRAL-1, -2, and -3 enrolled patients with or without cirrhosis, but excluded those with decompensated cirrhosis.5,6 ASTRAL-4 enrolled only patients with moderate (Child-Pugh B) decompensated cirrhosis.7 The results for the rate of sustained virologic response at 12 weeks after the end of treatment (SVR12), the primary endpoint, are summarized in Table 1. ADVERSE EFFECTS — Sofosbuvir/velpatasvir was generally well tolerated in clinical trials. The most common adverse effects, occurring in ≥10% of patients, were headache and fatigue. PREGNANCY — No adequate studies of sofosbuvir/velpatasvir in pregnant women are available. In animal studies, no adverse effects on fetal development occurred at exposures greater than those achieved in humans at the recommended dose. Ribavirin is teratogenic and embryotoxic; it is contraindicated for use in pregnant women and in men whose partners are pregnant. Velpatasvir is an inhibitor of P-gp, BCRP, and organic anion transporting polypeptide (OATP) 1B1, 1B3, and 2B1, and may increase intestinal absorption of drugs that are substrates of these transporters. Sofosbuvir/velpatasvir has been shown to increase serum concentrations of digoxin, rosuvastatin, and tenofovir and is expected to increase concentrations of atorvastatin. Absorption of velpatasvir decreases as gastric pH increases. Coadministration of Epclusa and a proton pump inhibitor is not recommended. Antacids should be taken 4 hours before or after Epclusa; H2-receptor antagonists and Epclusa can be taken at the same time or 12 hours apart. DOSAGE — The recommended dosage of Epclusa is one tablet once daily for 12 weeks. Patients with decompensated cirrhosis (Child-Pugh B or C) should also take ribavirin. CONCLUSION — Sofosbuvir/velpatasvir (Epclusa), taken as one tablet daily for 12 weeks, is effective for treatment of chronic hepatitis C virus (HCV) infection caused by any of the six major HCV genotypes. Addition of ribavirin is recommended in patients with decompensated cirrhosis. American Association for the Study of Liver Diseases and the Infectious Diseases Society of America. HCV Guidance: Recommendations for testing, managing, and treating hepatitis C. Available at http://hcvguidelines.org. Accessed August 2, 2016. G Cheng et al. GS-5816, a second generation HCV NS5A inhibitor with potent antiviral activity, broad genotypic coverage and a high resistance barrier. J Hepatol 2013; 58 suppl 1:S484. Absctract 1191. Available at: www2.kenes.com. Accessed August 2, 2016. EJ Lawitz et al. Clinical resistance to velpatasvir (GS-5816), a novel pan-genotypic inhibitor of the hepatitis C virus NS5A protein. Antimicrob Agents Chemother 2016 Jun 27 (epub). JJ Feld et al. 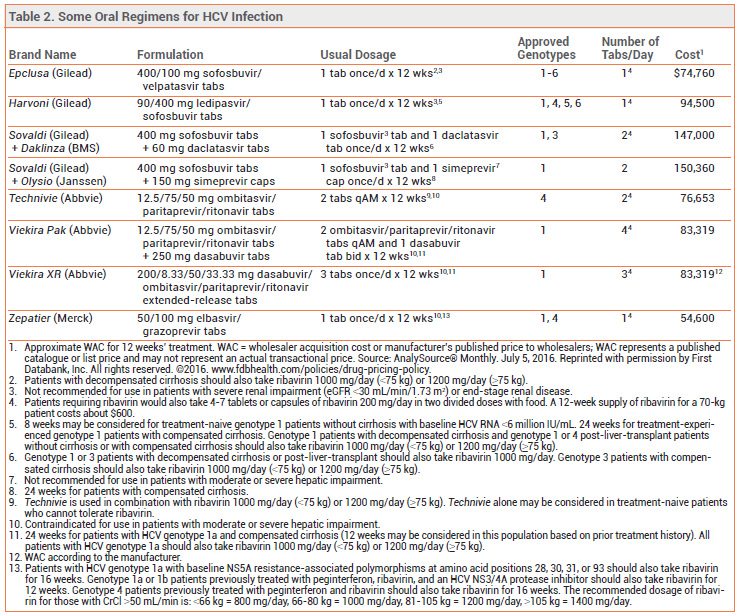 Sofosbuvir and velpatasvir for HCV genotype 1, 2, 4, 5, and 6 infection. N Engl J Med 2015; 373:2599. GR Foster et al. Sofosbuvir and velpatasvir for HCV genotype 2 and 3 infection. N Engl J Med 2015; 373:2608. MP Curry et al. 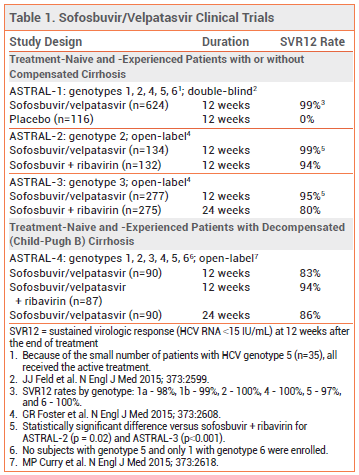 Sofosbuvir and velpatasvir for HCV in patients with decompensated cirrhosis. N Engl J Med 2015; 373:2618. D Wyles et al. Sofosbuvir/velpatasvir in HIV-HCV co-infected patients. Available at: http://slides.hcvonline.org. Accessed August 2, 2016.